As the Saudi-led coalition continues its offensive in Yemen, thousands in Sanaa took to the streets in protest against indiscriminate shelling that has claimed civilian lives. Meanwhile the Russia-called UNSC session failed to produce any results. Frustration, fury and raw anger prompted thousands of Yemenis to flood the streets of the Yemeni capital following another wave of Friday morning Saudi-led airstrikes. People were protesting against Saudi intervention in Yemen and the Saudi-led air campaign that has seen hundreds killed and thousands injured since the offensive began in late March. Thousands of people, some pointing rifles in the air, gathered to say ‘enough’ to what they see as a wider geopolitical game that is costing them lives. Protesters chanted slogans against Saudi Arabia, as well as its allies including the United State and Israel. Children, elderly and women also took to the stage to address the crowd. 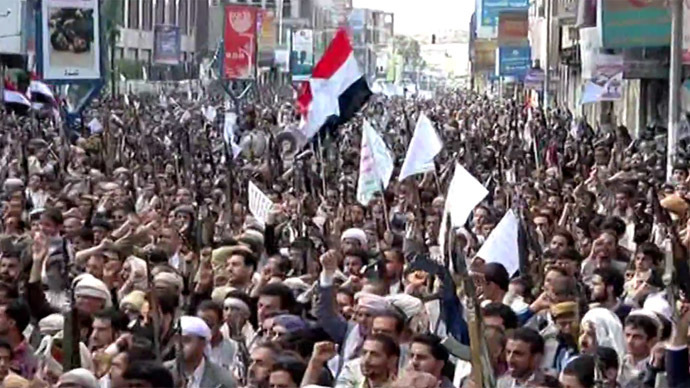 The rally is the second in the past two weeks and was organized by the Supreme Revolutionary Council of Yemen. Just hours before the Friday rally, Saudi warplanes targeted multiple targets around Saana, leaving several dozen civilians dead and injured in al-Sha'ab neighborhood and Sawan district, a medical source told FARS news agency. Meanwhile on Friday, the UN Security Council held an emergency meeting on Yemen called by Russia. Moscow remains concerned over the security situation in the country, and has frequently called on the 15-member chamber to endorse its resolution calling for humanitarian pauses in the bombardment and an all-inclusive arms embargo. Following the closed door meeting at the UN, Russia's envoy to the UN, Vitaly Churkin told the journalist that Russian proposal is still valid. “We continue to believe that our call for humanitarian pauses is very relevant. A lot of ... hospitals, schools, mosques, even the building in which the UN personnel lived in Sanaa, were destroyed on April 21,” he said. He also announced that Russian diplomatic staff came under attack on early Friday when a powerful shell exploded just 200 meters from the Russian diplomatic mission. “We believe that the sooner the Secretary General, and his Special Representative would be willing to convene a meeting and it will take place, the better,” said Churkin. “Attacks on civilians and civilian infrastructure, including hospitals, humanitarian warehouses and UN compounds, are unacceptable and in violation of international humanitarian law,” Ban added. Washington meanwhile said that it supports the Saudi position against Houthi militias. “The thing that we have articulated is that we strongly support the efforts of the Saudis, who are reacting to legitimate concerns that they have about the security situation along their border,” White House Press Secretary Josh Earnest said. At the same time Earnest said that the US continues to support negotiations. The five weeks of fighting in Yemen has left nearly 1,250 people dead, and at least 5,044 people injured between March 19 and April 27, the World Health Organization said Friday. Local estimates on the ground are much higher.